It's been a bit crazy in the Mahlke household as of late. And when I say crazy, I really just mean we've had multiple days out of our routine, which literally does translate to crazy in my family. The boys are creatures of habit and we all pay if we stray too far off the grid. Because of our busy schedules and then playing routine-catchup, we have taken a bit of an alphabet project siesta. But we're baaaaack! This week we reviewed the letters we've learned so far as a nice refresher. I used our door alphabet projects as a starting point, and we talked about each letter. Well, mostly, I alligator-chomped, bee-buzzed, crab-pinched, duck-quacked and elephant-trunked them around the room. But they laughed. They were engaged. It was a successful alphabet review. One morning during breakfast Spencer worked through several pages of an alphabet workbook. We brought our review outside one afternoon, armed with chalk and squirt bottles. I drew bugs on the driveway and each bug was branded with a letter. Apparently I am not a talented artist because Spencer asked me why I was drawing a sun. 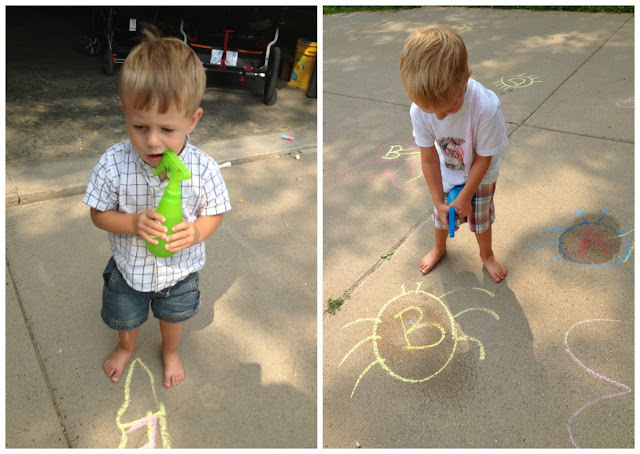 The goal was to squirt all the bugs with the letters I wrote on the driveway. Ashton whined and fussed that he couldn't squirt the water into his mouth, but Spencer willingly participated in this activity. Once all the bugs were doused, he continued squirting whatever he pleased until he drained the water bottle and came begging for more. I'm fairly certain the water bottle was a hit; the alphabet activity was just the means to an end. Another day during snacks I pulled out some paper, Q-tips and paint and encouraged the boys to trace the letters I had pre-drawn on the paper. Spencer attacked the E like it was his job, less enthusiastically outlined the D with the Q-tip and then forwent the planned project completely and painted as he pleased. Ashton, on the other hand, never attempted to follow the rules. 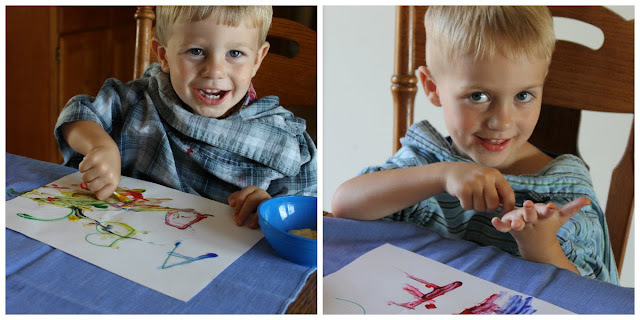 He dove right in painting his hands and mouth and ears (duh, Mommy, that's what Q-tips are for!) and whatever else he could get at before I redirected his hands. I hung the Q-tip pictures on the artwork board below our review flashcards. Throughout the week we periodically discussed the letters on the board. 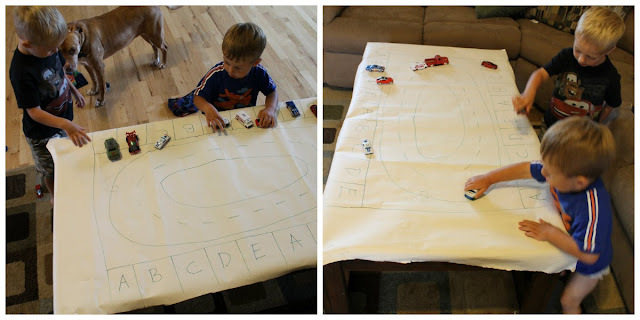 For our final activity I taped a big piece of heavy paper on the coffee table and drew a race track and a bunch of garages. Each garage was assigned a letter. I also wrote numbers on pieces of tape on cars*. The object was to park the cars with the corresponding letters in the garages. This lasted for all of two minutes before I gave up and we just raced around the track. It's also become a field for a John Deere tractor and a helipad for a rescue helicopter. And it's been torn and taped. *Footnote: I'd like to state for the record that no Hot Wheels (not to be confused with Matchbox cars) were harmed in this activity.